Science of the Saints, 1-I-2019 (19 Dec.), The Holy Martyr Boniface. The Holy Martyr Boniface was the slave of a rich young Roman woman named Aglaida and he dwelt with her in an iniquitous cohabitation. But they both felt the sting of conscience and they wanted somehow to wash away their sin. And the Lord deigned to grant them the possibility to cleanse away their sin with their blood and to finish their sinful life with repentance. Agliada learned that if relics of the holy martyrs be reverently kept in the home, then through their prayers it becomes the easier to receive salvation, since under their graced influence sinfulness is diminished and virtues prevail. She arranged for Boniface to go to the East, where at the time there was a fierce persecution against Christians, and she asked him to bring back the relics of some martyr or other, who would become for them a guide and protector. In making his farewell Boniface laughed and asked: “And what if, lady, I do not find the relics, and instead I myself suffer for Christ? Wilt thou accept my body with reverence?” Aglaida took his words seriously and she scolded him that he was setting off on a sacred matter, but he was not taking it seriously. Boniface pondered over her words, and the whole while of the journey he was absorbed in thought. Having journeyed to Cilicia, to the city of Tarsus, Boniface left his companions at the inn and proceeded to the city square, where they were torturing the Christians. Struck by the beastly horrible torments, and seeing the faces of the holy martyrs radiant with the grace of the Lord, Boniface was drawn to them with sympathy in his heart, and he rushed up to them, kissed their feet and besought their holy prayers, that he also might be found worthy to suffer with them. The judge thereupon asked Boniface who he was. Boniface answered: “I am a Christian,” and then refused to make the sacrificial offering to idols. They therewith gave him over to torture: they beat him so hard, that the flesh lay bare the bones, they stuck needles under his nails, and finally they poured molten tin down his throat, but by the power of the Lord he remained unharmed. The people round about the judgement-seat went into an uproar, they began to throw stones at the judge, and then they headed off for the pagan temple, to cast down the idols. On the following morning, when they had quieted down the unrest somewhat, the judge directed that the holy martyr be thrown into a cauldron of boiling tar, but this also caused the sufferer no harm: an Angel come down from Heaven moistened him, and the tar overflowed the cauldron, splattering and burning the torturers themselves. 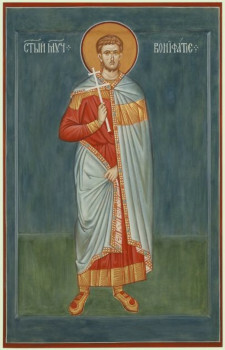 Saint Boniface was then sentenced to beheading by the sword. From his wounds flowed blood and a milky fluid; beholding such a miracle, about 550 men believed in Christ. Amidst this the companions of Saint Boniface, waiting at the inn for him for two days in vain, began searching around for him, thinking that he had gotten caught up in some frivolous pastime. At first their search was without success, but finally they came across a man, who had been an eyewitness to the martyr’s death of the saint. The eyewitness also led them to the place, where lay the decapitated body. The companions of Saint Boniface with tears besought of him forgiveness for their unseemly thoughts about him, and having ransomed for a sizeable sum of money the remains of the martyr, they brought them back to Rome. On the eve of their arrival an Angel appeared to Aglaida in her sleep and bid her prepare herself to receive her former slave, now his own man and a patron, serving together with the Angels. Aglaida summoned the clergy, with great reverence she received the venerable relics, and then she built on the place of his grave a church in the name of the holy martyr and put there his relics, glorified by numerous miracles. Having distributed to the poor all her wealth, she withdrew to a monastery, where she spent eighteen years in repentance and during her lifetime she acquired the miraculous gift to cast out unclean spirits. She herself was buried nearby to the tomb of the Martyr Boniface. Previous Previous post: Science of the Saints, 31-XII-2018 (18 Dec.), The Holy Martyr Sebastian and His Companions. Next Next post: Science of the Saints, 2-I-2019 (20 Dec.) The Holy Martyr Ignatius the God-bearer.